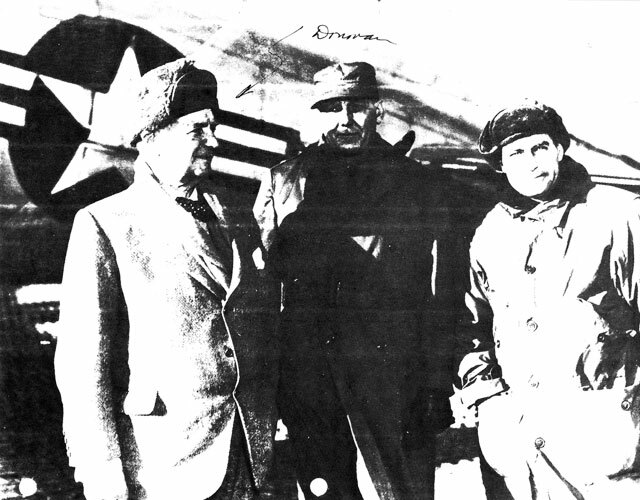 "Wild Bill" DOnovan was born in Buffalo, New York, on New Year's Day of 1883. He was educated in that up-state city, and entered Columbia College, Columbia University, in 1901. While at Columbia, Donovan played quarterback on the varsity football team. Graduating in 1905, he immediately enrolled in Columbia Law School where he was a classmate of Franklin D. Roosevelt. In 1907, Donovan began a law practice in Buffalo. Five years later, he was instrumental in founding a cavalry troop of the New York National Guard in his hometown. When the cavalry was called out for operations along the3 Mexican border, Donovan left his law books. By the outbreak of World War I, he was a Major. Donovan earned his nickname in France as a battalion commander and later as regimental C.O. of the 165th Infantry--popularly then known as the "Fighting 69th New York." He was wounded three times, and received a number of combat decorations including the Distinguished Service Cross and the Medal of Honor for gallantry in action at Landre-et St. Georges during the Meuse Argonne offensive. Following the war, Donovan served as an unofficial U.S. military observer in Asia, and then resumed his law practice. He was U.S. District Attorney for Western New York, 1921-24, and Assistant U.S. Attorney General for the same area in 1925. During this period, Donovan became extremely active in Republican Party politics. From 1925-29, he was Assistant to the Attorney General of the United States, and was also a member of several international organizations, including the Red Cross and the Rio Grande Compact Commission, which he chaired. In 1928, Donovan was presumed heir-apparent to the Attorney Generalship of the United States, but his appointment was opposed by party conservatives, largely because of his Irish-Catholic background. President Hoover instead offered him the post of Governor of the Philippines, which Donovan declined. Donovan returned to private law practice,and in 1932, ran unsuccessfully for the governorship of New York State. Subsequently, he was involved in a number of personal fact-finding trips to world trouble spots, including Spain and Ethiopia. When Germany invaded Poland in 1939, Donovan's expertise in European affairs and his friendship with political rival FDR, resulted in a series of quasi-official visits to England and the Balkans. Donovan was psychologically prepared for the shock of a new European war. By then, he was 57 years old and had a proven track record in observing international affairs. Additionally, he was a millionaire, a sophisticated patriot-nationalist, and best of all--so far as the President was concerned--an ardent interventionist. Moreover, he was a close friend of Knox, the Republican Vice Presidential nominee in 1936, whom Roosevelt had brought into the Cabinet as a symbol of national harmony. Not only did Knox recognize Donovan's talents, but so did Churchill's dapper Canadian emissary, William Stephenson, the now famous "Man Called Intrepid." Together, Stephenson and Knox were instrumental in securing for Donovan his appointment as Coordinator of Information, a title which he held from July 1941, until COI was redesignated as OSS the following year. Largely became of military opposition to the new central intelligence, service, initial attempts to impart legitimacy to the organization by giving Donovan general officer rank were rebuffed. After the success of OSS operations in North Africa, however, Donovan was appointed a Brigadier in April 1943. He became a Major General in November 1944. After President Truman dissolved OSS in October 1945, DOnovan briefly served as aide to Justice Robert H.Jackson, chief prosecutor at the Nuremberg war crimes trials. He returned to private practice in 1946, but continued to actively support the lobbying effort which eventually resulted in the formation of the CIA. President Eisenhower appointed him American Ambassador to Thailand in 1953. Donovan died on 8 February 1959 in Washington.